Banners Gate Primary School in Sutton Coldfield has benefitted from PK Education’s sponsorship of four reading corners and an ongoing commitment to pupils’ reading opportunities. The school, which accommodates pupils aged 3 to 11, now has ‘reading corners’ in all classes. Teachers had previously used their own money to fund the project before PK became involved. The dedicated areas allow pupils to read to one another, on their own, to staff or a teddy – however they feel most comfortable. They also create a colourful focal point in each classroom, reinforcing positive connotations with reading. 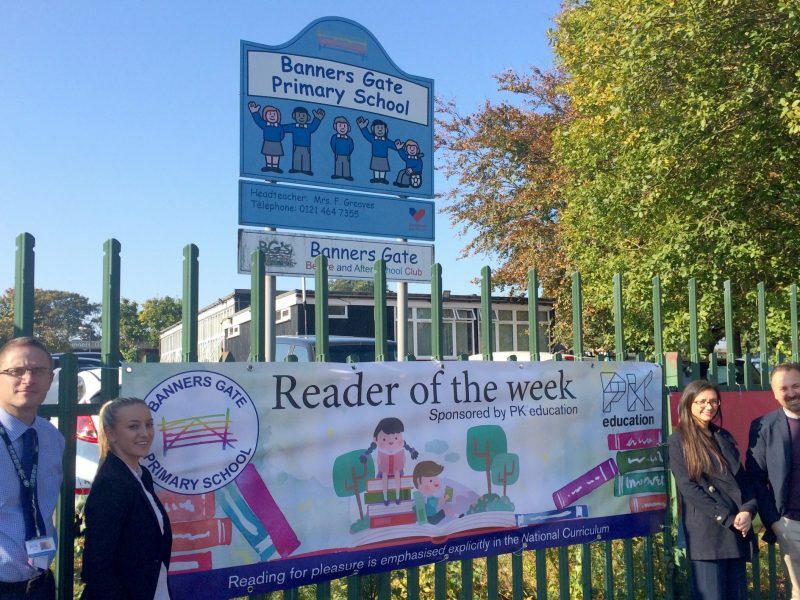 Following PK Education’s sponsorship, Banners Gate Primary School will also be introducing a Reader of the Week initiative as a further encouragement for the pupils. Volunteers from the community read with the pupils on an ad-hoc basis, bringing another dimension to the school’s reading offering, adding something different to the pupils’ experience, strengthening links with the community and allowing others to see the impact that reading has on children. PK Education have furthered their sponsorship offering by also getting involved in reading with pupils. This will be the first time that a business has been involved in the reading programme and is something the school is looking to encourage. Lee Carpenter, Director of PK Education visited the school along with Eve Beer, the PK consultant who looks after Banners Gate, to present them with four gazebos, extra reading books and stuffed animals to help complete the reading corners and spent some time reading with the pupils. Just under 400 pupils are currently enrolled at Banners Gate Primary School and will benefit from the reading corners initiative. PK Education believes in building relationships with schools and teachers based on understanding and respect in order to positively affect pupils’ educational experiences. If you are a school looking for supply staff or looking to explore sponsorship opportunities, please contact your local PK Education office.